@CrossfireCNN @SECupp - Because they are fighting the fight that needs to be done finally. Democratic rule would being our debt to 20T plus! @CrossfireCNN @secupp I think many have been in congress too long, making no change or progress. It's ridiculous. Van Jones response represents how every Democrat feels and acts, when he says why start the process now for preserving the veterans rights. Well, you have to start somewhere, because it is the right thing to do. You can tie that with Harry Reid's response when he replied: why save one little child. The answer is because it is the right thing to do and you have to start somewhere. Seem the Democrats want it their way in full and only that way, regardless the circumstance. @CrossfireCNN VanJones is very intelligent and a skilled debater! Believe that the few are running over the majority. Obamacare is the law people, why can't the Tea Party give it up. @CrossfireCNN What's wrong with "cheery picking"? Wouldn't that be positive steps? Obama keeps stirring the pot vs moderating a solution. 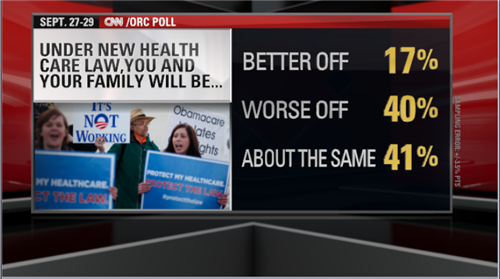 #Crossfire Republican says no one wants the #ACA , except for 70% of people that do. @VanJones68 #Crossfire I am embarrassed to admit that I have voted for a few Republicans in my lifetime..a few too many. Voting on Obama care or c.r. by the house. Really? Let c.r. come before House to see what the votes will really be. Come on! #Crossfire Repubs didn't learn anything from Reince Priebus's autopsy report.They went from "The Stupid Party" to"The Jihadists Party"
Vote....Vote......Vote. Wow Van...you are good!! Emily is wrong! People who can't get health care want this affordable care. Dems and the GOP needs to work to make the law better; not put a negative connotation on it by calling it Obamacare. You know there are people that don't like our President and will be against anything with his name attached.
.@EmilyMiller getting OWNED by @VanJones68 on #Crossfire right now! Haha! Last count was actually 57% of Americans did not want the ACA with 10 % undecided, where does anyone get a 70% of people want this. If that was the case the Republicans would have never won the house in the first place. The fact remains that the Affordable Care Act is not affordable. It is taking up a huge portion of the economy. During last years election the President said it was all a lie when Republicans said it was going to cover 25% of the economy. He was right we found out after the election it was actually 33%. This is the last option left to stop the ego-maniac, Barrack Obama before the whole country is on the hook for this mess.